Last week, the word came down that Jim Kelly passed away. Kelly was the master of drag racing photography, and I had enormous respect for the man and what he could do with a camera. Kelly was also a great encouragement to me when I first started covering racing professionally. Even back then, there were only so many pages to fill in motorsport publications, so competition was intense between photographers vying to get their images in print. Some of the established freelancers were helpful and friendly, but there were some real jerks who did their best to discourage any newcomers. 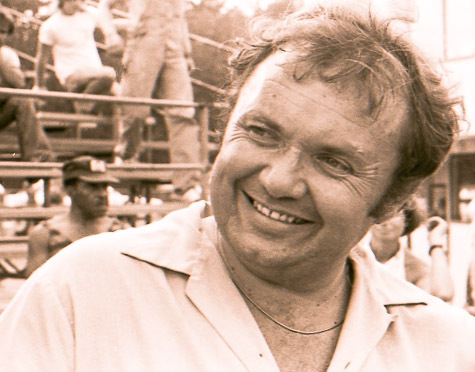 Kelly had safely established himself as a premier automotive journalist, so he wasn’t afraid of competition, Instead he gave me encouragement and treated me with respect..
My favorite Jim Kelly moment came at Detroit Dragway in the mid-seventies. At the time, Kelly was the chief photographer for the American Hot Rod Association (AHRA.) Prior to switching back to NHRA sanctioning, Detroit was sanctioned by the AHRA for several years. Detroit hosted two AHRA national everts each year, and, of course, Kelly was on hand to cover the events. My friend Dave Tubek and I were there to provide coverage for Drag News. We did quite a bit of bench racing with Kelly between rounds, discussing the race and the state of drag racing in general. On Sunday, Kelly became rather antsy. He had a plane to catch and he was afraid if the race ran late he would miss his flight. Kelly’s worries intensified when one of the top fuel cars literally Vaselined the track at the top end. That might have been the worst oil down I ever witnessed. The engine let go around the 800-900 foot mark and sprayed oil and debris all over the race track for 600 feet. It took forever to clean up the mess. Gil Kohn always hired a wheel stander to appease the crowd during incidents like this, and Chuck Poole made several wheels-up passes to entertain the spectators. Eventually, however, Poole completed his exhibition runs and we were left with an empty race track, except for the guys scrubbing the top end. Even the announcer ran out of things to say. After three days of hearing the constant roar of un-muffled engines, interrupted from time to time by the clatter of supercharged, nitro burning Hemis, it was eerie to be surrounded by silence. Kelly was not happy. I could hear him muttering things like “Comeon — lets get going.” under his breath. Detroit Dragway didn’t have guard rails at the time, just those wide ditches on either side of the track. But there was a short length of Armco railing protecting a set of bleachers near the starting line. The three of us lounged on he railing, staring down at our shoes while we waited for the the race to resume. After what seemed like an exceeding long time, a couple of pickups came back from the top end, their beds filled with burly guys holding brooms. I took that to mean that racing was about to get underway again..
Strangely, there was no activity on the starting line. The clean up was completed, a pair of funny cars were waiting in the lanes and the crowd was getting restless. Still, several minutes ticked by with nothing happening. Kelly and I looked at each other. Neither of us could figure out why they hadn’t restarted the race. I’m sure most of the spectators were wondering the same thing. Finally, Kelly had had enough. He snapped to attention from his perch on he railing. Cradling his camera in his arms, he marched purposely to the middle of the starting line. As I watched in fascination, he peered toward the top end, which was completely empty. He looked behind him where two funny cars were waiting, bodies up, crews in position and electric starters in place. Then he looked up at tower, which was still eerily silent. And they did! The flopper crews were just as anxious as we were to get back racing, so as soon as Kelly started twirling his wrist, both cars spun over and exploded into life. That is the only time I saw a photographer give the command to start the cars at a major race, Usually there is a competition director, or maybe an official starter. Sometimes one of the high-ranking track employees might issue the start command. But a photographer? No way. I don’t remember who won the race that day. I don’t know if Kelly actually made his flight that day. But I won’t forget the proud look in Kelly’s eyes as he rejoined us along side the track. Kelly had a great night shot of the Colt on the staring line, and he needed some black & white photos for a feature he wanted to develop around his image. Naturally, I agreed and spent a great afternoon with Ronnie Sox. We shot the Colt in a field at the top end while Gatornationals qualifying was going on. That was my favorite Jim Kelly assignment. That was a long time ago. Detroit Dragway is gone. Ronnie Sox is gone. Super Stock magazine is history. The AHRA is only a shadow of what it once was. And now, sadly, Jim Kelly is gone as well. But whenever I think of Kelly, I will remember him restarting the field at Detroit Dragway. And I will smile. This entry was posted in 2015 and tagged AHRA, Detroit Dragway, drag racing, Jim Kelly, photography, Tom Bonner. Bookmark the permalink. Post a comment or leave a trackback: Trackback URL.